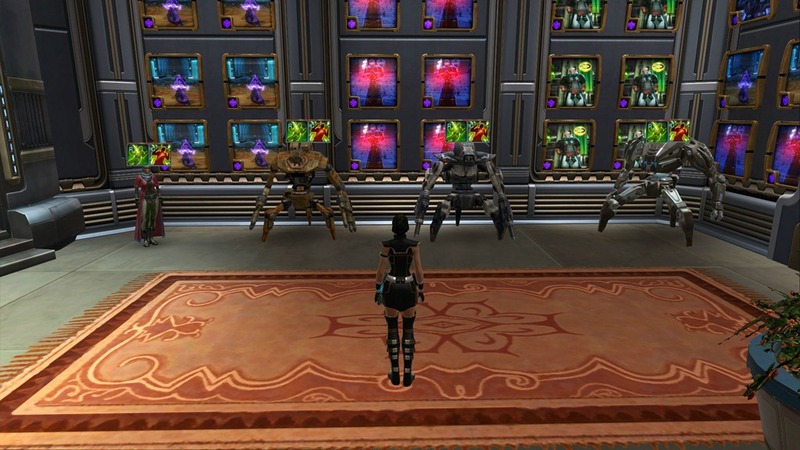 SWTOR 3.1.2 Serenity Shadow DPS Guide by Aelanis of The Shadowlands, with contributions from Evolixe. Serenity plays very similarly to the old Balance Shadow. Energy Management became somewhat easier outside of execute range, and very tight in the execute range, and the AoE rotation was almost entirely revamped. With the new Serenity Strike, and change of self-heals from triggering on periodic effect critical hits to being simply damage based, we saw a huge increase in self-healing and survivability that has made it the go-to spec for PvP. Utility selection should go on a boss-by-boss basis, as we have a wide variety of abilities that can make certain situations go from challenging to sleep inducing. With the loss of damage on Leeching Strike, in combination with the resultant loss of healing and the reduction of life steal from Discharge and Creeping Terror, Hatred has been hit really hard in PvE, to the point where Deception can easily tie, if not beat, Hatred in both damage and survivability. Almost all bosses are better fought in Deception at this point. This is due to Deception’s AoE damage reduction skill and the spike damage prevalent in this tier of Hard Mode Operations forcing healers to keep DPS at near full health, which means they won’t give you the time to let your now fairly meager self heals do their work. Paired with nearly equal damage to Deception, there remains almost no reason to bring a Hatred Assassin to an Operations setting. **Must Have** Accuracy: As close to 758 accuracy rating as possible. Reaching the Accuracy cap should be your highest priority. Due to nasty diminishing returns beyond the first 250 points of Surge, Alacrity is going to be very important in 3.0, especially since it makes your periodic effects tick through faster. The split will likely end up being a 3:2 Surge:Alacrity ratio for non-augment pieces through most of 3.X, though current Best in Slot looks like a 2:2 ratio for 192 and 198 gear levels. Critical rating fell vastly in usefulness in 3.0. Double Strike is down 20% of its old Surge boost, and gone is our surge boost on periodic effects and Force in Balance, though we picked up 30% on Spinning Strike. 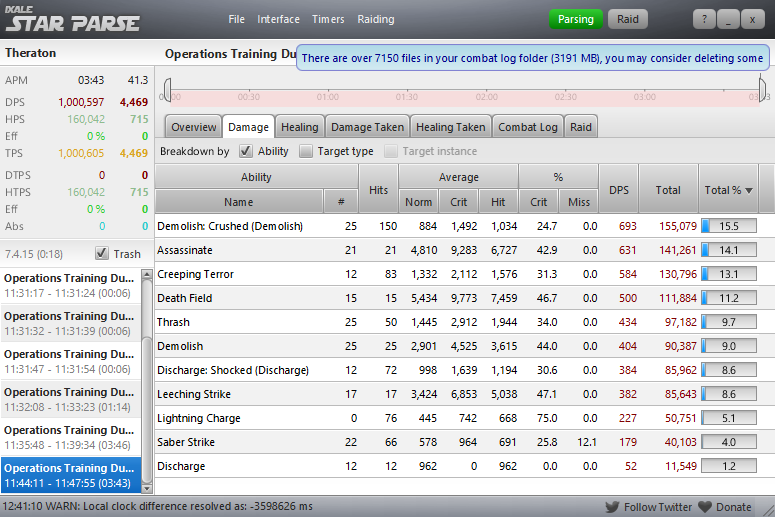 A smaller portion of our overall damage now has a Surge boost, but that doesn’t make the stat completely obsolete. Choice of relics should be made on a fight-to-fight basis. Serendipitous Assault and Focused Retribution will give you a greater overall damage increase, while Boundless Ages will allow you to focus your burst into a short window for fights with tight burn phases. Getting your set bonus as quickly as possible is highly recommended. It will increase your DPS substantially enough that having lower item level armorings with the set bonus is still a better option than higher item level armorings without it. Despite the old 4 piece giving a substantial boost to the critical chance of a move used quite often, it is not as valuable, even with the new 2 piece, as the full new set bonus. You can PM Aelanis on the forums for these calculations. As in RotHC, gearing a DPS character will require grabbing numerous pieces. Below, I have listed below what you want to trade your token for, and why it may be a good choice. Power is rare in our set, and we require much more of it than we do crit, so pick up more of these pieces if you can. We also need a whopping 758 Accuracy rating, so Accuracy/Power pieces are incredibly valuable. Unfortunately, you’ll need to keep your eyes open for other pieces with Accuracy/Power enhancements, since we don’t get even a single one in our set bonus. You may end up getting a lot of Force Master’s boots. One more thing to remember: no offhands/main hands in this entire tier of gear have a color crystal in them, so don’t forget to add your favorite one in! Implant 1 Stalker’s MK-X Package Power Accuracy Accuracy/Power! Earpiece Force Master’s Device Power Accuracy Accuracy/Power! Bonus Force Master’s Boots Power Accuracy Acc/Power enh!!! There are a few utilities that you’re going to want regardless of the fight, and a few that have situational use, but are not always mandatory. Each boss you’ll probably want a different Utility set. However, there are a few you should have for each boss fight, due to them being so strong in general. That leaves 4 more utilities to choose based on the boss. Force Breach (FB) in Force Technique has a different mechanic from Infiltration, so instead of being an instant damage ability, it deals damage periodically over time. Having Force Breach active on a target allows you to trigger your Force Strike ability, which is a very important part of the spec, and should have as close to 100% uptime as possible. Its duration is 18 seconds, which is important, as will be discussed later. 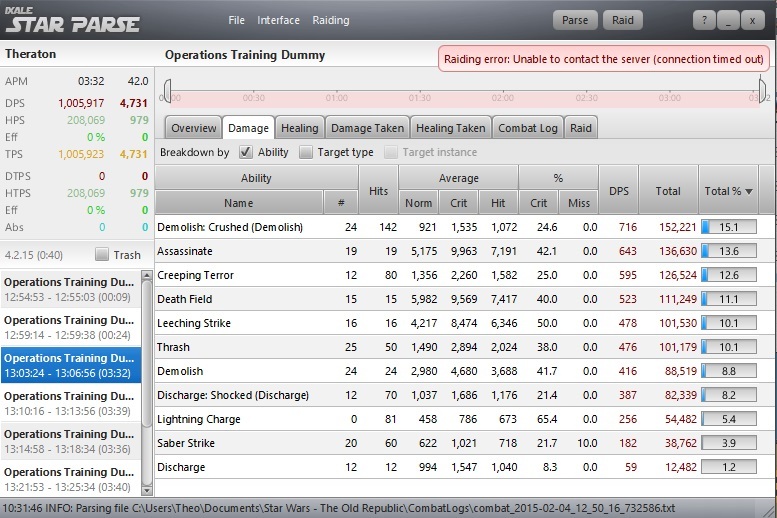 Sever Force (SF) is your second long duration periodic damage ability. You should keep as close to 100% uptime on the ability as you can. It is your primary choice for long range abilities while gap closing, as it has a 30 meter range and no cooldown. Its duration is also 18 seconds. Double Strike (DS) is your general purpose filler ability, for if you have plenty of Force and nothing else to spend it on. Double Strike, with the 6 piece set bonus, will also trigger your Stalker’s Critical Bonus, causing your next Spinning Strike to critically hit. This plays an important part in the opener, and causes you to use this ability even in the Force starved execute phase. Serenity Strike (SeS) is a new ability given to Serenity in 3.0. It is a hard hitting ability that heals you for as much damage as you deal with it. It also triggers your 2 piece set bonus, giving you a 2% increased damage buff for 15 seconds on a 30 second lockout. It should be used on cooldown, despite the cooldown not lining up with the lockout on the 2 piece set bonus, due to the amount of damage it deals. Vanquish (V) is one of your hardest hitting abilities. Due to the Force Strike talent you get, it should (almost) always be free and an instant cast. You want to maximize uptime on this dot, which dictates that you want to trigger Force Strike as close to its 9 second rate limit as possible. This heavily affects your rotation. Replaces Mind Crush. With 3.0, this ability causes its target to take 5% increased Force damage from all targets. As such, you should put it on the boss as quickly as possible to benefit the rest of the raid. Force in Balance (FiB) is an incredibly important ability. It does not hit quite as hard as in 2.10, but still packs quite a punch, and now hits up to 8 targets. It also leaves 15 Stacks of Force Suppression on its targets, and will spread your Force Breach and Sever Force effects to its targets that are not already affected by them. For single target situations, it is best to use this ability on its 15 second cooldown. With 3.0, this ability causes its targets to take 10% increased area of effect damage. Spinning Strike (SpS) Should be your top damage contributor. Normally usable only under 30% in the execute phase, Serenity has the Crush Spirit ability, that lets you use it on targets of any health, with a 30% trigger chance on any periodic damage effect. Pre-execute phase, it should be used in place of a Double Strike only, while it takes priority over everything except Force in Balance during the execute phase. Whirling Blow is your bread and butter AoE spam move. Use it when you have more than 2 targets in range for better effect, as it costs as much as Double Strike, but will do far more damage. The opening rotation is a chance to deal quite a bit of damage in Serenity, as well as set you up for the entire rest of the fight. Start by pre-casting Vanquish into: Force Breach > Adrenal + Relic + Force in Balance > Double Strike > Spinning Strike > Sever Force > Serenity Strike > Vanquish. This sets you up for a very high damage Spinning Strike, as the Vanquish ticks combined with the Force Breach ticks give you a roughly 92% chance of having Spinning Strike ready to go, and also a slightly higher chance that you have both relics (if not using a click relic) going for the auto-crit for maximum damage. Unfortunately, Serenity Strike does not fit into the opener until later as losing a relic boost on the auto-crit Spinning Strike is a damage loss over the 2% damage boost. An opener that does not hurt your Force bar as badly, and lets you open up from further away, would be: Sever Force > Adrenal + Relic + Force in Balance > Force Breach > Double Strike > Vanquish > Serenity Strike > Spinning Strike. It does not pack the same punch as the first opener, nor does it flow into the normal rotation cleanly, but has a much easier Force recovery phase that follows. There are two ways to look at the rotation for Serenity: Move Priority and a strict Rotation. Those Fs in there aren’t just for Force in Balance: you’ll typically use Vanquish in there. Vanquish will, if you go from the suggested opener, land on the second and fifth F spaces, and once in a while be delayed from the second to the third F space when Force in Balance passes through. Because of its 12 second cooldown, Serenity Strike, used in the M* spaces, will never interfere with Force in Balance, Sever Force, or Force Breach, allowing for perfect usage on cooldown during the pre-execute phase. Spinning Strike and Double Strike will always fall into spaces where nothing else interferes. Most of this is quoted directly from MK’s old guide, and updated for 3.0. “The only difference in this method is it always prioritizes Vanquish reapplication instead of the rigid Force Breach and Sever Force reapplication. This means it can be a little harder to follow in an actual fight but this priority does flow perfectly into the execute phase and is exactly what you end up doing in the DoT Focus method during the execute phase anyways. Openers will be the same as the other method, the differences show up when you get to the second DoT applications and later. Saber Strike usage: Saber Strike will refund you 1 Force each time any of its 3 hits actually land. With a 10% miss rate, it averages to 2.7 Force per use. You need to always make sure you have enough Force to get through your DoT application. If you leave 3 spaces between your long duration dots, you have 2 moves you can always count on in there to recover Force, as Force in Balance may be coming through. The Force in Balance + Sever Force + Force Breach combo will cost you a whopping 70 Force, and you naturally recover 60 Force over the course of the 5 GCDs. With a cost of 20 and 30 being possibly back to back, you need to start with at least 38 Force going into this block. If you have more, you may not need to Saber Strike. If you have less, you’re going to have a bad time. Keep aware of this, and use Saber Strike proactively, not reactively. Dot application dos and don’ts: If your target isn’t going to survive at least half the duration of your dot, don’t bother; it will be a damage loss versus just hitting it with Double Strike. Force Breach may still be useful for Force Strike triggers, but that’s it. I’ll go more into this in the AoE section. On Force Wave: With Force Wave now being limited to 8 targets, you generally won’t use it any more. Whirling Blow hits the same number of targets and does more damage without knocking enemies back. We still have Project and Telekinetic Throw? Sometimes you can’t quite stay in melee range, but want to keep doing damage. That’s when these abilities come into play. They aren’t rotational, but they have a 10 meter range, and Project can be used on the move. Useful if you have to, say, kite Raptus in the Dread Council fight. About Force Potency: You want Force Potency to be used on Force in Balance more than you do on Vanquish. If you have to delay activating it a few seconds, it’s not the end of the world, and will still net you more damage that way. Conversely, if you’re in an AoE situation, you want to use all but 1 stack on Force in Balance, to maximize the number of critical hits you get, because all critical hit chances are calculated before any of them remove the Force Potency stacks. If you mess up: It’s going to cost you a chunk of damage, but freaking out and messing up more will cost you even more. If you accidentally delay an ability (like Force in Balance) or mess up dot reapplication, do what you need to in order to fix it, even if it means clipping dots on your next application or delaying Force in Balance by a global to get it back on track. Don’t let things snowball out of control, or your damage will drop sharply. With the advent of 3.0, you can now spread your long duration dots from one target to up to 7 more. You must simply have one target in your Force in Balance’s range that has one of Sever Force or Force Breach (or both) applied to it, and up to 7 additional targets will become affected by those dots. With more than 8 targets, the selection becomes random and which ones you hit is out of your control, save for targets that have your Sever Force or Force Breach already on them. Please note: Vanquish will not spread to other targets (which would be hilariously more overpowered), do not waste time applying it before Force in Balance. Case 1: You have some number of targets (Evo used 4). You hit one with Force Breach and Sever Force. After you use Force in Balance to hit them, all 4 have both dots, because none of them started with it. Case 2: You have some number of targets (Evo used 4). You hit one of them with Force Breach and another with Sever Force. After you use Force in Balance to hit them, all 4 will have both dots, since Force Breach will spread to all targets without it and Sever Force will spread to all targets without it. This method is a little trickier but a little safer. Instead of risking killing your only “host” (has all the dots) if you crit when they don’t have a lot of health, you have less chance to crit and kill both of two hosts. The spreading works just as well, and it’s slightly less likely to kill low health enemies instead of spreading your dots, it just requires more constrained placement of the Force in Balance ground target. It’s also less predictable in PvP. It can also ensure that you hit 2 different targets with Force in Balance that you want to make sure die first (or get more damage dealt to them) by forcing the game engine to select them as targets for Force in Balance. After you spread your dots, if there are 3 or more targets, you want to spam Whirling Blow. If they all survive for 18 seconds, you can simply repeat this rotation (dot up, Force in Balance, Whirling Blow). The only thing you must remember is to let your dots fall off each enemy other than the “host” or else they won’t spread to all targets. In the case that they don’t all survive for 18 seconds, you still have a target with both dots on them and can begin you single target rotation. Some general rules of thumb for AoE: after your first rotation, if all of your targets (2 or more total) have less than ~25,000 health in a flashpoint, ~70,000 health in an 8 man raid, or ~150,000 health in a 16 man raid when Force in Balance comes off cooldown, don’t bother reapplying dots or delaying Force in Balance, they won’t survive the group’s AoE damage to make up for the lost damage. This number will go up as your group gets more geared and/or skilled. Vanquish (Demolish, dot) should be taking first or second alongside Spinning Strike. It ticks very quickly, resulting in roughly twice as many times as your other two dots independently. Depending on critical hit luck, they will alternate between parses. Like Spinning Strike, it’s worth roughly 14-15% of your damage. Spinning Strike (Assasinate) should be one of the top two damage dealers for Serenity. You use it fairly often, it hits incredibly hard, and you use it an absurd amount in the execute phase. It’s worth roughly 14-15% of your damage. Sever Force (Creeping Terror) takes third place. It receives a lot of damage boosts from the tree, and has very good uptime. It’s worth about 13% of your damage. Force in Balance (Death Field) hits particularly hard, and has a very high critical chance thanks to Force Potency. Used on cooldown, it should end up in fourth place. It contributes roughly 11% of your damage. The last 10% is split roughly equally between Force Technique and Saber Strike. Despite hitting very often with a very high crit chance, Force Technique and Saber Strike just don’t hit very hard. For damage breakdown, roughly 25% of your damage (Force in Balance and Sever Force) is Internal/Elemental, while the rest is Kinetic/Energy. A further split shows that roughly 64% of your damage is Force damage, while the remaining roughly 36% is melee damage. This goes to show that your dots (and Force in Balance) are an incredibly important part of your damage. Lastly, that roughly 11% of your damage that Force in Balance is worth is Area of Effect damage. You can use this information to try to work out with your raid team what debuffs you want to try to include on your team. Aelanis is an avid forum-goer on the Shadow/Assassin forums, hailing from The Shadowlands. Despite having only raided Nightmare content since 2.8 released, Aelanis has put up very competitive numbers on numerous boss fights and previously held a spot on the World DPS leaderboards. If you play on the Shadowlands, you can reach him on Theraton, in Exit Area on the Imperial side, or Ellendra, in Death Mark on the Republic side. Only error I can see is it should read ‘Force Technique’ instead of ‘Lightning Charge’. Otherwise nice job. Thanks I think I eliminated most of them, let me know if you still see lightning charge. All errors should be gone. Ty vm for this guide. I have a question. With the set that you can buy with basic comms (186) is very hard to obtain the stats priority that you suggest. Due to the Accuracy, only have 3 pieces availables to play with it. If I get 2 of them with Surge will reach 204, or 63.24% and the last one with Alacrity will reach 102, or 1.35%, both under the suggesteds levels. The other consideration is to get Surge in the 3 pieces, but Alacrity will be 0%. What is your recommendation? 3 pieces with Surge or 2 with Surge and 1 with Alacrity? Thanks for your response. I did that, 7 pieces with Accuracy and an Accuracy augment, The 3 “free” slots must be filed with 2 Surge and 1 Alacrity, no matters that they don´t reach the desire %? Or just go for 3 Surge Enhancements? The “desired %” is just the values you reach in token 198 pieces (or 192), and your gear just isn’t that good yet. You want to try to get the same kind of ratio between Alacrity and Surge until you get there, so yes, 2 Surge, 1 Alacrity, even though you don’t meed the suggested %s. Ty vm for your kind response! I would suggest 2 Surge, 1 Alacrity, but only if you think you can achieve a high enough APM to benefit from the Alacrity. If you can’t hit 40.5 APM without the Alacrity (that parse I gave isn’t spectacular…), you’re better off taking the Surge, since you can’t get the full benefit from the Alacrity. That assessment will change as you can take more full use of the Alacrity, and has to be re-evaluated for every combination of Surge vs Alacrity. Also, it’s very hard to obtain those values with 186 commendation gear because the 186 commendation gear is terrible. The old 180 Ultimate commendation gear is about as good, as you only lose a little bit of Willpower in the armoring, since the new commendation gear has B lettered mods. If you have any Dread Forged gear, keep it over the new commendation gear, as it is strictly better. I´m so sorry, I didn´t read this before. I have some old 180 pieces, will check how to play with them and the ones that I need to replace. Great guide Aelanis, thank you very much ! I have one question though: with what gear did you get the 4.3k dps output? Once again, great work, keep it up! a better one once I have my new full 6 piece and the 192 main hand. I’m also going to say I could have done better, and should have. I messed up a bunch (especially in the execute phase) and used Leeching Strike poorly. Thank you for sharing this, good update to already very good mknightrider text. A question about cooldowns: Does Battle Readiness/Overcharge Saber provide enough of a DPS increase for you to pop it on cooldown or do you keep it as DCD? And FP/Recklessness, pop it CD or delay it till next force attack to maximize the chance of using all charges in case of stingy RNGeesus? Oh and one thing I wondered in original as well: Why 3 GCD separation between the dots? To avoid collision with other CDs? Or something else? 3 GCDs seperation is the minimum required to have it this way, while also allowing a 12 second Serenity Strike cooldown. Of course, sub-30 it all changes, but this way you have 18 seconds on your 18 second DoTs, 9 seconds on your 9 second cooldown DoT, 15 seconds on your 15 second cooldown AoE, and 12 seconds on your 12 second cooldown hard hitter. Thank you for the clear explanation! I see the point and will adjust my rotation accordingly. Are you talking about PvP? Then yes, it’s a defensive cooldown. Or at the very least keep it for when you need health and there is no healer around to heal you. If PvE, then no. Use it on cooldown. I was thinking about PVE. Charge/Technique hits like a marshmellow so thought it might make sense to ease healer’s job on raidwide damage. But yea, any DPS boost is a plus so maybe that was a stupid question. You hit the nail on the head, there. The boost, like I explained, is also somewhat larger than it seems single target, and still very significant on multiple targets. Battle Readiness is a decent, if not spectacular, damage boost, but probably not for the reason you think. Double Strike has 2 hits, Saber Strike has 3, and Whirling Blow hits as many targets as are in range, up to 8 (same for Force in Balance). The really neat part about Battle Readiness. That means that your Force Technique will activate, on average, 1, 1.5, and n/2 (where n is number of targets hit) times on those abilities, respectively. That means you’ll get an average of 5, 7.5, and n*5/2 Force back each time you use those moves. Battle Readiness, in addition to the added damage of the Technique damage (+50%, which multiplies through on the crit! ), trigger more often, helping you to recover more Force, which lets you use fewer Saber Strikes for the duration. With the refund of ~7.5 Force, and 12 passive Force recovered, Battle Readiness makes Double Strike almost Force neutral, letting you spam it quite a lot, which is a much larger damage increase than the boost to damage from the ability itself. Because of this, use it on CD, unless an AoE portion of the fight is coming up, because the damage increase is very significant on multiple targets. Take note, Force in Balance can also trigger your Force Technique and you can recover Force off of it! As for Force Potency, delay it until immediately before a Force in Balance. You only get a very small benefit from using it on Vanquish’s initial hit, and a much larger one on Force in Balance. With 3 charges, you stand a better chance of getting the third charge to be spent on Force in Balance if you limit the amount of time you have the Potency buff when not using Force in Balance (and so you pop it immediately before you use the move). This part should be in the guide, though, but I’ll add the first paragraph into it. As for the rest, everyone else has answered those questions. Can’t believe I somehow missed the FP in the guide :/ And I’ve been selling BR short as DD cooldown, it seems. I didn’t realize the implications on force recovery and was stuck on the damage boost. Live and learn, will adjust accordingly. There is no “Force strike” ability. Please change that text. I don’t know what u refer to as i read ur very nice guide. Aelanis whats the advantages of using a 3 GCDs between FB & SF instead of 1 ? Is there any other besides force management? Kwerty has a valid point. 3 GCDs gives you a space to force in Serenity Strike on cd, and also gives you some more wiggle room in the execute phase before your rotation falls strictly into a priority system because Spinning Strike is just so important. Is there any ETA on 3.0 Kinetic Combat Shadow tank guide please? It’s being written. Hopefully it will be done soon ™. I’m pretty sure double strike does more damage than whirling blow cause it always crit more with the passive in the discipline ? The way you wrote it do you think it is as good to use whirling blow on single target instead of double strike cause if yes I rather make space in my keybindings lol ? Only for AoE. He’s mentioned in AoE situations it does more than Double Strike, but outside of AoE situations you use Double Strike. It actually does not critically hit more often, just significantly harder when it does. I want to do a little comparison when I have the time, of just how much average damage Whirling Blow does vs. Double Strike on 2 enemies. It’s a simple thing, but I need to go grab the equation for Whirling Blow. Would it be possible to add a section to explain defensive abilities and such? I guess so. It’s not something you can really do a lot about: your primary defensive ability is your self heals. You have Shroud, which you’d need to know what it works on on a case-by-case basis, and then Deflection, which is much the same: only works on certain mechanics. Using your Mass Mind control is the only method you have of mitigating damage regardless of the damage type, and it’s also your threat drop. I apologize ahead of time, as I’m new to this class, as my proficient toons are the GS/Sniper and PT/Vanguard. When you’re referring to Shroud, do you mean Battle Readiness? No, I do indeed mean Shroud. Shroud provides 3 seconds of 200% resist against Force and Tech attacks baseline as well as purging all removable effects from you. Sorry, yes, Resilience. My Assassinese got the better of me. The first opener image says Demolish instead of Vanquish for the mind crush replacer ability. Could u put a utility guide to? Uhh, it was there. I put it back. Not sure how it got removed, but I put it back. Thanks for the guide! Was a great help in picking up the spec and adapting to the changes. I had a little better luck keeping just one GCD between dots; had to delay Serenity Strike at some points, but it was easier to keep track of everything. That is certainly one way to do it. I listed the Force Master boots there just for that reason. You’re getting into actually substantial losses of Willpower there, but it’s possible that it’s better for your average dps to do that. I have to agree with Fjeldraeven. I ran a spreadsheet and the 120 alacrity/surge is indeed better than 104 willpower, by a few points of dps (not significant, but not nothing either), and that’s taking the .01% miss chance into consideration. Even so, that’s only 1 in every 10,000 hits that won’t land. You’re right that in 204 gear, the six accuracy items and zero augments will likely be better, but it’ll be a long time before anyone is in full 204 gear, and it doesn’t cost much to change a few augments around when that point comes. I would never run less than 100% accuracy in a raid setting, but yes, I can see how that setup might be slightly better. I don’t think it’ll be all that long, though, once the 204 gear is released in game. The optimized enhancements drop in Operations, and so guilds will be able to farm the first few bosses on Nightmare to get their enhancements, where they can get all of their accuracy, and carry on from there. With your max damage (auto-crit from 6 pieces) opener Serenity Strike misalign with Force in Balance on the 3rd FiB or it’s just me ? If you’re using up a lot of time not using moves (not using them immediately one after the other), you’ll run into the problem, but if you maintain a good APM, they won’t interfere. Everything in this guide assumes you’re perfectly using your GCDs and not wasting any time. How can the 3rd V (count precast) only get 5GCD in between ? When does the ICD start ? on V use or just every 9s ? Sorry,ot my mother language but thanks in advance for you help. The instant Vanquish triggers on melee attacks. It triggers in the first Double Strike GCD, and again on the third Double Strike GCD, which happens exactly 9 seconds after the first one (or 6 GCDs). The melee attack that triggers the instant cast starts the internal cooldown on Force Strike, and so you have to use a melee attack every 6 GCDs in order to trigger Force Strike as much as possible. Yes, you use Force Technique. It’ll be more and more fun with each lvlup. One note – you’ll get all of your important skills on about ~36lvl. Try to teach your rotation from that point, remove all useless skills fron tollbar (Force Wave especially), and good luck! Thanks strannik. A Question. I see no mention of shadow strike telekinetic throw (i think thats what its called) here so am I right in assuming both are pointless for serenity. You won’t use Shadow Strike, though, it costs far too much Force for not enough damage to justify it in this spec. Ok thanks Aelanis. So worth keeping project and telekinetic throw on bars then incase I need some range. I been using them alot while leveling up as lower lvl not many abilities but am 36 now so can start learning rotation as vanquish just replaces mind crush so I guess I can just replace vanquish part of rotation with mind crush until I hit 57? So just for an easy say can you write every single abilitie that I should not have on my task-bar and should never use or just wont need at all? “Each ability has its use, and basically every single one of them should be available to you somehow, even if it’s just on a bar off to the side of your screen. Even Mind Crush, which is replaced by Vanquish, currently has a use in PvP. You won’t use it in PvE, though, nor will you use Force Lift or Force Slow very much. Every other skill is fair game, though.” – Quoted from just above. So just for an easy say can you write every single abilitie that I should not have on my task-bar and should never use or just wont need at all?? Each ability has its use, and basically every single one of them should be available to you somehow, even if it’s just on a bar off to the side of your screen. Even Mind Crush, which is replaced by Vanquish, currently has a use in PvP. You won’t use it in PvE, though, nor will you use Force Lift or Force Slow very much. Every other skill is fair game, though. what do you mean by “Even Mind Crush, which is replaced by Vanquish, currently has a use in PvP.”? It’s somewhat broken right now, in that you can hold off on a Force Strike proc to use Vanquish, melee attack a target with Force Breach, and then immediately use Mind Crush, and have both ticking on a target at the same time. Paired with nearly equal damage to Deception, there remains almost no reason to bring a Hatred Assassin to an Operations setting. <—- Strong Words. I follow you on the SWTOR forums as well. Care to qualify this? I am just worried that the average traveller to this site will read this and we'll see people denying Madness/Serenity from SM pugs based on these words. Which would be terrible is this comes off as dramatic. Slightly less survivability and equal damage sounds like choice, not doom to me. Deception has AoE DR and 9% more DR (additive more at that!) than Hatred. That’s more than “slightly less survivability.” And if people are going to exclude a class from a story mode raid, they need to examine why they’re finding a story mode raid hard, when they can be 5 manned. I’d link the video, but it expired because my guildmate forgot to highlight it. We 1 heal, 1 tank, 3 dps’d the first 4 bosses in Ravagers, and would have done the fifth boss if people hadn’t shown up. If we can 5 man the Op, you can carry any class you want through there. Besides: people who would exclude a class/spec from a SM raid probably wouldn’t be reading a guide on this website. You’d be surprised then. Words like these create mass hysteria. You’ve basically declared the discipline dead on Dulfy. How are you directly comparing the effectiveness of self hots (nerfed) Serenity to DR(buffed) Infiltration? In my mind a direct comparison would be a little tough due to their differing natures. I mean the have the same end in function, but very different means. Are you implying that in your ops team as serenity/hatred you are now far less healable? Are you tracking what you were healed for on the same fights as Deception and HaTred? What’s the difference there? Curious. So here’s the thing. If we had perfect up time on the boss, we’d have 800 hps in 3.1.1. In 3.1.2, that’s down to 600. Roughly 20% of that is effective, because healers freak out when you go from full to 40% in one hit and heal you back to full, which makes your heals much less effective. Now, on top of that, let’s consider that the flat 9% DR, on a 1300 dtps fight, with 50% of damage being AoE, 861 dtps in Deception. You’re taking 250 more damage per second AFTER self heals, and doing roughly equal damage, except their damage is all burst damage. I see so there are really 2 issues. 1. Healers freak when they see low health bars and fill them (who can blame them?) 2. While they are doing so, Serenity’s Self Hots are ticking rendering their healing less effective while they are ticking for less than they did last patch. The Point you are trying to make is that the Self Hots are are not as effective as a concept really when compared to DR. It’s both an arithmetical issue (dtps,dhps from multiple sources) as well as a psychological/habitual issue on the part of the healer. So I guess this is kinda like a PSA for your healer then….just switch to deception and be less of a drag….Ugh…I love the concept of Serenity…. They freak because you’re in danger of dying. It’s a very real thing. If you eat a barrel throw as a load lifter is coming at you in Hatred, unless you’re completely full on health, you’re dead. Period. And they can happen in rapid succession. There’s nothing they’re doing wrong. Self heals are just bad as mitigation against spike damage. If Assassins took 3 500 damage ticks a second, it wouldn’t be so bad, but instead, it’s a 30k bomb every 40 seconds with 15k hits going out every 20 or so. I see, yeah I was agreeing with ya. Was not intending to label the issue as healer fail. Will the sage telekinetics/balance DPS guides be changed for 3.1.2 as well? I didn’t write those guides, so I can’t really say. I’m trying to find a good link that discusses up to date stat priorities and rotation examples for shadow knights in warzones. Anyone know any good ones? This was a well done guide by the way, but kinda leaves PVP end game players in the dark. Just reply with links, thanks. Keep this thread useful. I run 0 crit and use a crit relic and 72% surge. It seems to really help in 1v1’s at a node because you are guaranteed a crit pop. Node capture 1v1: Pop out of stealth with spinning kick>> dot force breach>> resilience>> FiB>> sever force (root)>> kite >> force speed + double strike>> deflection>> vanquish>> spinning strike>> serenity strike>> double strike>> battle readiness>> vanquish >> spinning strike. Have you experimented with using shadow strike + saber strike over double strike? It seems like overall dps would be similar, but less RNG dependent, due to double strike’s +30% surge bonus. It would be strictly less. Before critical hits come into play, 2 Double Strikes, on average, hit harder than a Saber Strike + Shadow Strike. With the 30% Surge bonus, the difference becomes even greater. Even substituting an extra Thrash in for the Saber Strike every 4 two-part combos due to the extra Force gain from Saber Strike results in less damage. In the end, Thrash does more damage in every possible scenario. It ends up being around 100 dps on average, between the two possibilities. It also forces you to keep a positional requirement, which can be frustrating. That’s not terribly useful, but yes, I suppose I could. It’s been a while since I did any serious content with him, though, and I stopped raiding Hard Mode with him a long time ago. I have too much critical rating on him, as well, from switching things around to use the highest item level gear I could. Any chance you’re working with PTS 3.3 with the new changes? Horrible thing they’ve done to Serenity with FiB not spreading the dots anymore. Now it’s gonna be whirling blow. Just curious how much this is gonna change the spec. I’m not looking forward to it. You’re going to stop playing Serenity seriously in PvE, if you did before. There’s only going to be one fight to use it over Infiltration for, but for everything else, Infiltration is going to be better. So, do I get it right that rotation is just reappling dots, using fib and filling gaps with melee? In a very basic sense, yes, that’s correct. It’s more involved than that, but if you boil it down to the basics, that’s what you get. Is anybody still doing this spec now that 3.3 has dropped? It seems like that patch made the dot spread almost impossible to achieve. If it matters I mostly do PVP with my shadow now, but as soon as the new expansion launches I will shift back to PVE. While DoT spreading is harder, serenity still has a lot to offer… For one thing, you can keep dps’ing where infiltration can’t (like in Bulo from the Ravagers). Also, your survivability is still higher than an Infiltrator’s. Anyway, if you read the infiltration guide, you’ll see that he says there that Serenity is better… So there’s a mistake here or there. No, it doesn’t have a lot to offer. The situations where it used to be able to out-dps Infiltration were nearly entirely due to dotspread, which is now useful only on fights where it really doesn’t matter or isn’t useful as a mechanic in general. There are no situations where Serenity can keep up reasonable damage that Infiltration can’t do the same. You can perfectly well keep up DPS on Bulo as Infiltration, you just have to know what you’re doing. Even Underlurker isn’t an advantage for Serenity any more (you can melee him while the rocks are down, as long as there’s a rock reasonably close to the boss). Besides having 2 moves usable outside of 10 meters (1 of which is a dot, the other of which only extends past that due to its AoE), there’s very little that Serenity really has left against Infiltration offensively. The only thing it can do that Infiltration can’t match is multi-dotting, and there are exactly 2 cases, and 1 burn phase, in this tier of Operations where that’s a moderately good idea. Serenity’s survivability is laughable. It used to be that you’d take the hit for the better damage, and hope you don’t get crushed when you take big hits back to back, but now the damage isn’t there to make the trade worth it any more. Infiltration has ~30% passive K/E DR and ~20% against I/E damage (which is tank level) AND it has AoE DR, further keeping it safe in PvE. Both specs get Shroud, and while Infiltration can’t stealth out as a DCD, it’s not that great as a DCD in PvE, unless you’re using it for the extra Shroud, and your DPS can suffer if that’s what would save you. Serenity has ~400 hps. That puts them at Deception’s passive levels, except that it leaves them hugely vulnerable to spikes, like getting triple probes on Master/Blaster or getting a barrel as you eat a load lifter on Bulo. The Infiltration guide that Artorias wrote is now out of date, and I can guarantee that he agrees with me on what I’ve said. I believe you when you say that Infiltration is currently a better spec DPS wise then Serenity. What I meant is that Serenity still is a viable option in all ops. I don’t play competitively, and wouldn’t know which spec puts out higher numbers, but I do know that I can (and do) run Serenity on both RAV and ToS. Also, Artorias’s guide has changed a bit, and is updated to August. He changed the foreword, and he says that the spec you choose depends on the fight, so I assume you are right, in that he thinks Serenity is worse off.